Ugh. So many movies to choose from.. THEN once I decided on a movie.. I failed my way through a few nail ideas.. Then I was like 'oh, derp!' and did something simple.. Or so I thought it would be. Except that I screwed up the placement of two items.. BUT.. I think that is ok. PLUS I was running out of time and needed to get these bad boys done so I could go study. Yeah. 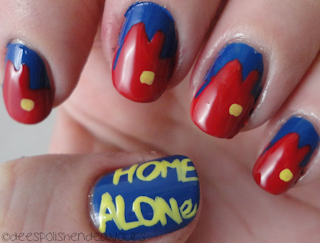 I went with Home Alone. I have a very special place in my heart for the movie (ok, and the second film!!) Plus I kind of love Macaulay Culkin.. And the character Buzz McCallister. I first went with a bunch of little elements that make up the movie.. But I kept messing something up and restarting.. That was getting to be a large mess. I finally decided to go with the house that is on the cover. I placed the chimney on the wrong side and technically the blue should be darker.. But ahh well, I tried! I do believe The Daily Nail did Home Alone nails at one point in time? I used Essie Mesmerize as the base, the some Essie Silken Cord and Orly Spark to finish it up. Again, could have been better.. I spose I should try a bit harder. If I didn't have exams and assignments looming over my head, maybe things would be better.. AND I know I shouldn't use excuses as everyone has something going on in their lives at any given time. Merp! I'll do better.. I'll try! @Mr Lonely - Thanks for stopping by!